After a soak in the hot tub, an enjoyable evening of Nepali language lessons and another really good night’s sleep, I wake up jazzed and ready to go with images of me skipping blithely along the trail with mountain creatures peeking out to say hello. As with most delirious musings, it doesn’t exactly happen that way. The morning starts off well. It’s a clear, crisp morning and I’m relishing the memory of the Garung bread and honey I had for breakfast. We cross paths with locals on their daily routine, climbing up or down steps with what looks like impossible loads: lengths of rebar, propane tanks, loads of firewood. A smile and a namaste they’re gone. I pause to coo at a baby goat wobble towards his mother; nearby, a male asserts his authority on a less fortunate specimen of the herd. 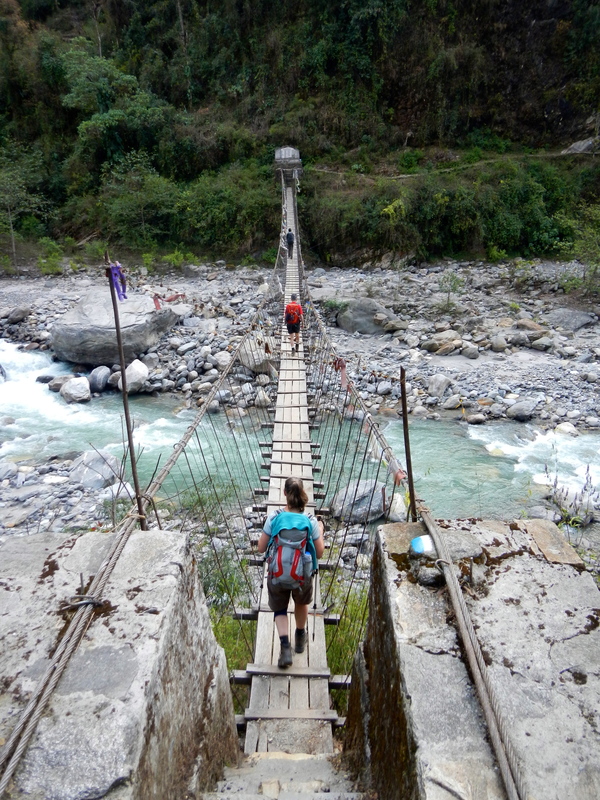 We cross the mighty Modi Khola for the last time on our journey. The river has been a constant since we started; I feel a little tug as I cross the suspension bridge and leave it behind. The trail leads us through valleys, up through the terraced hillside towards the town of Landruk. The views are spectacular, the walk is pleasant and yet…I find that I’m dragging my feet a bit. The distance between my friends and me grows incrementally by only inches as we progress but by the time we reach Landruk for a tea break, I’m trailing by at least five minutes. At first, I don’t understand it. The hike isn’t any more strenuous than any we’ve already done. My hiking boots are well worn in. As the sun rises, it’s definitely warm, but the temperature doesn’t explain the lassitude I feel or the doldrums that I’m in. I sip my cup of tea and gaze at the vista that stretches before me. Then I realize what’s weighing on me: it’s almost the end. We have only one more night on the trail and then it’s back to Pokhara and then Kathmandu and then I have to leave. I don’t want to leave. I want to stay here, on the trail. I like the certainty that I’ll get up and hike; I’ll see beautiful scenery and things that I don’t see in every day life; I’ll be surrounded by people I enjoy; I’ll be tired and a bit sore at the end of the day; I’ll sleep without waking. When I leave the trail, that ends. I have to pull a Scarlet O’Hara and think about it another day. Otherwise I might never leave Landruk. We stop at Namaste Guest House in Tolka for the evening, a larger property than we’ve experienced previously as the number of rooms allowed is not restricted here (it is higher up on the trail). There’s a large lawn and we’re told that a bonfire and music usually ensues after dark. The rain that batters the metal roof this evening cancels the pyrotechnic revelries, but we’re entertained with toothpick mind games and I try Nepali rum for the first–and last–time. After amazing dal bhat, the highlight of the meal is a cake from our host, Santosh. It’s a culinary marvel, a cake baked on an open gas range; it’s delicious. Watch out, the path’s slippery. The next morning, it takes two cups of coffee to open my eyes completely. I consider asking Santosh if he needs extra help at the guest house so I can remain there. Then I consider what talents I have to offer; somehow I don’t think he needs someone to run a trivia or karaoke night. I leave with regret. 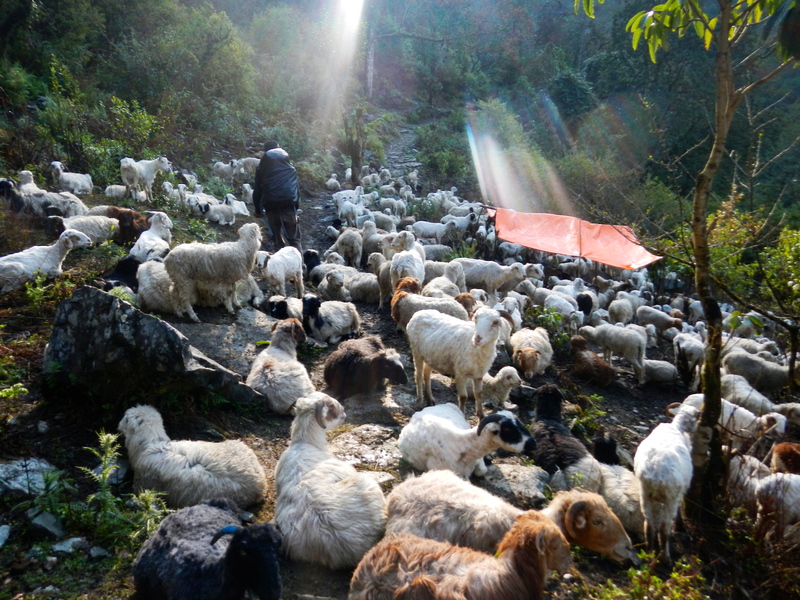 On the way to our first tea stop in Deurali, we encounter a Nepali traffic jam: a herd of sheep is lounging on the path, completely unperturbed by us weaving our way through their midst. Maybe it’s the insolent sheep, or perhaps the sun slanting in through the trees just right, that shakes off my mood. I realize that, like or not, I’m heading back to the world today–I’d better enjoy every minute of this last hike. The route does not disappoint. We meet a miniature porter in Deurali and enjoy the vista of Dhaulagiri, Annapurna and Himchuli before the clouds start obscuring the view. We check out of the Annapurna Conservation Area at the office; yet another indication that the journey is almost over. Rhododendron forests give way to meadows. Lunch is in Dhampus, where the expansive view of the mountains gives us an excellent vantage opportunity to marvel at how far we’ve come (for me, both in physical and mental distance). Stone staircases lead us through bigger towns and the mountains disappear behind the ridges we traversed that morning. All too soon, we’re tromping down a dusty access road in Phedi, making our way to the van that will transport us back to Pokhara. There’s congratulatory hugs all around that we made it and I do feel a great sense of accomplishment. But it’s a bittersweet victory, for I don’t know when I’ll be able to return. And I desperately want to return. Tags: Annapurna, Dhampus, nepal, outdoors, Phedi, Tolka, trekking. Bookmark the permalink. The highest Annapura I (8091m), the deepest Kaligandaki River gorges and the dense forest of rhododendron of various colors and old villages like Manang, Kagbeni, Jomsom, and rural communities are the distinguished features of the Annapurna region.